Blogs Oracle database grid technology (ASM, RAC, Enterprise Manager), virtualization, cloud computing and linux. Following the release of Oracle Solaris 11 Express last week, I took a cue from the The Fat Bloke's blog and decided to try out the new Automated Installer feature. 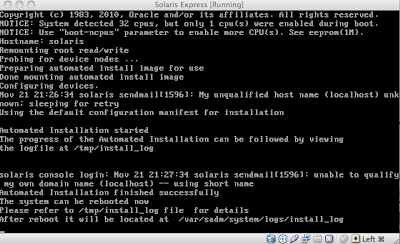 Being a n00b to Solaris installation I wanted to find a relatively painless path to installing Solaris. 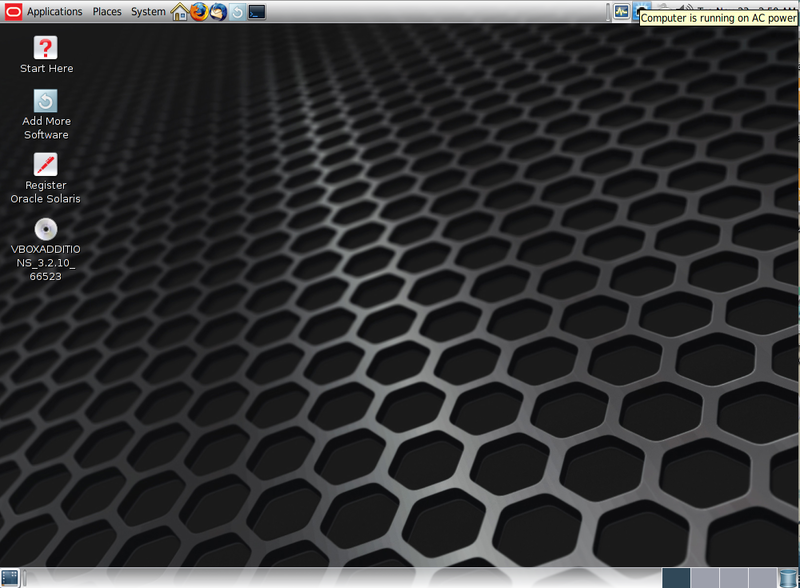 Having imported the previous Solaris 10 update 8 VirtualBox image however, I thought this would be a good challenge. The Automated installer allows network-based installation of multiple systems in a fully automated manner. It relies on an Image Packing System (IPS) package management system to find the version and type of architecture (SPARC vs x86) required for installation. You can customize the manifest files used to determine which packages you want installed. The AI is also bootable, which allows for an automated local install without any interaction. Just select the default install at the boot menu and it will initialize the installation and select the default IPS located at http://pkg.oracle.com/solaris/release. iso from http://www.oracle.com/technetwork/server-storage/solaris11/downloads/index.html, booted it and selected the default install. 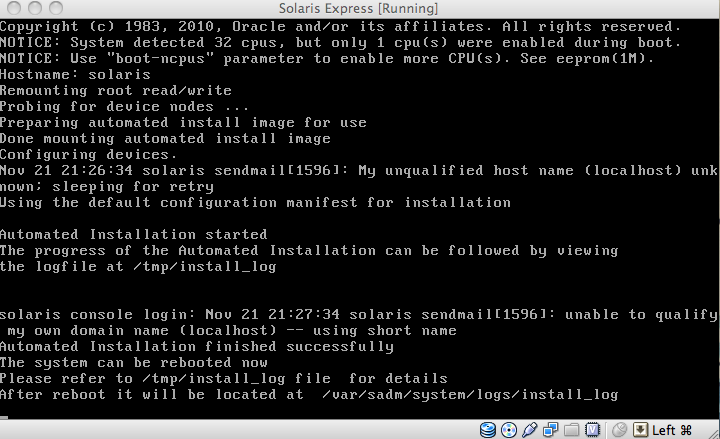 After about 75 minutes my Oracle Solaris 11 Express machine was ready. I would recommend reading the documentation at this point. However, being impatient and having self-induced ADD, I went ahead and tried to log in with the root username/password. At some point I was asked for the root password and I took a guess at 'solaris' which worked. At the GUI login screen I again attempted to login with root and 'solaris' but this kept giving me some weird message about roles. Still refusing to read the documentation I extracted the installation iso and dug through the default.xml file which is the manifest used for the default install. There I found the username 'jack' with what looked to be an encrypted password. I decided to try jack as both username and password...and well it worked! 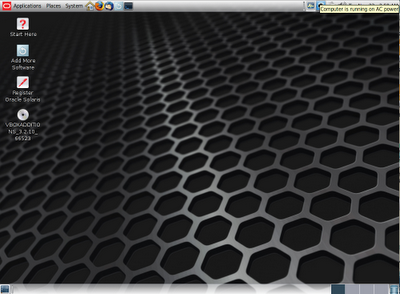 After login in I was greeted by the lovely desktop below. I had a solaris 11 automated install and ur blog was of great help !! Thanks for the info worked for me! ASM trace files begin with the "+" prefix. On Unix/Linux I normally view database trace files using the more/less or vi/vim/view commands. These commands and their variants however accept the "+" command as an option. Run 'man' on any of the commands to see what the "+" option does. Trying to use either of these commands may leave you a bit bewildered at first. Error: ORA 20 Text: maximum number of processes exceeded Cause: An operation requested a resource that was unavailable. The maximum number of processes is specified by the initialization parameter PROCESSES. When this maximum is reached, no more requests are processed. Action: Try the operation again in a few minutes. If this message occurs often, shut down Oracle, increase the PROCESSES parameter in the initialization parameter file, and restart Oracle. But what if you cannot connect to your database to shut it down and increase the parameter? Here are some steps I used to troubleshoot the failure of a public network used for SCAN in a 2-node RAC cluster.